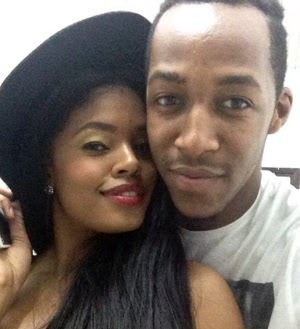 Today is Idris Sultan's birthday, and the BBA Hotshots winner actually turns 22! The Tanzanian, who walked out of the Big Brother house US$300,000 ricer and recently got a new house, found love in the house as well. After the show, Idris and South Africa's Samantha spent time together in his country and their love has burned brightly ever since. "After the stunt you pulled on my birthday. I now feel like I need to write a poem and have it co written by the likes of Maya Angelo and post it on a Billboard. May her soul rest in peace . But since she's not around I figured I only have my 'talents' and honesty to depend on. You make me laugh even if I don't want to. You have my back even when i don't expect it or feel I deserve it. You show me right from wrong. You understand me which I don't know how. Cause I sometimes don't understand myself . The truth of the matter is you still keep me sane. So I really don't have a choice but to wish you a Happy Birthday and many more. Cause quite frankly who else is gonna do all of that for one person so I kinda need you around. And in turn you can trust that I'll always have your back no matter what. I'll always be here when the world looks tough Always try my best to keep that stupid smile. And give up a couple of shillings just to hear you laugh. Love you for all the things you never knew you were doing God Bless. Happy Birthday Idrisi." Keep shining Idris.Samy you are indeed a companion.My gut feeling tells me the words came out effortlessly.Your guys energy and glow is infectious and is sure resonating in leaps and bounds. Get a life u BiG NOSED, BLUE or r u BLACK FACED envious FOOLS! aren't they yummy...her graphic contours elevates idriss unto a soulful realm. ain no dream the young man's experience is downright poetry. The only way to get love is to give luv-he a lover like that!